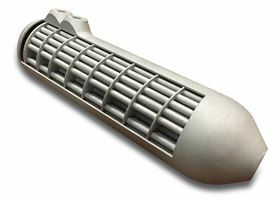 A heat exchanger manufactured as a single component utilizing an EOS M290 direct metal laser sintering machine. US software provider ANSYS and the University of Pittsburgh have formed a partnership to develop products to help improve additive manufacturing (AM). 3D printing metal can be particularly challenging because it involves the use of a laser. While the laser improves the density of the metal for the particular application, it can also melt the metal in unexpected ways, causing the product to fail, which the rapid heating and cooling causing stresses that can deform the end product. ANSYS and Pitt are working together to simulate those deformations before printing to help ensure the product not only has the desired shape, but also performs as expected. Simulation-driven product development can help improve AM by virtually exploring the properties of a number of design options early on, before committing to specific material and design choices. The benefit of physics-based computational tools is that they can test millions of permutations of designs, materials, flows and shapes to find the best design before the engineer needs to build a single physical prototype. As part of the partnership, the university is opening a 1,200 ft2 additive manufacturing lab in the Swanson School of Engineering. The ANSYS Additive Manufacturing Research Laboratory is equipped with additive manufacturing devices that utilize metals, alloys, polymers and other materials to laser print components for nearly every industry. The partnership will also support faculty and students conducting collaborative research with ANSYS and other industry partners, including those in the biomedical, aerospace and defense industries. ANSYS and Pitt’s work in was initiated with funding from America Makes, the National Additive Manufacturing Innovation Institute. South West Metal Finishing (SWMF) has developed a new chemical immersion treatment to improve the surface of AM parts for aerospace.